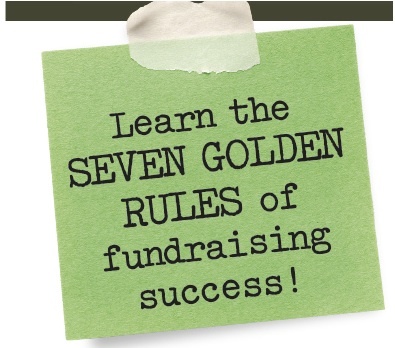 Fundraising success is not only about what you do to get people to give. It is what you do to make your nonprofit an organization worthy of receiving the support of people. For your cause to succeed, you need to find a lot of people who care about your work. You want the people who support you to do more than write checks, you want them to take ownership of the mission themselves. This can not happen until you are thinking from the perspective of your donors. The Golden Rules below will guide you as you do development for your organization. Success will require your time and effort, but as you practice and become more familiar with these rules, it will become second nature. Rule 1: Know Your Donors : The basis of good fundraising is the treatment and cultivation of donors and the ability to ask them to support your organization in proportion to their ability to give. The urgent need for your nonprofit is to know your donors as well as you possibly can. The foundation for having this kind of relationship is quality research and good information. Having a good knowledge of your donors and their contributing habits is key to persuading them to donate their money. Rule 2: Educate Your Donors: Guerrillas know the meaning of the adage “What people are not up on, they are down on.” They make sure they educate their supporters, because an educated donor is a happy donor. It is tough for people to give their money to an organization when they have fears that the money may be spent unwisely. Some of your donors may have the mistaken notion that giving to your nonprofit is merely fueling a maintenance program that never really solves any problems if you do not keep them updated about your progress and the impact they are making through you. Who wants to give to an impersonal maintenance program? Guerrillas reassure their supporters about why giving to their organization is a smart move. Education calms fears and improves communication. Rule 3: Help Donors Find Personal Fulfillment: People want to make a difference. They are seeking personal fulfillment through supporting your cause. Nonprofits that are aware of the psychology of their supports are far ahead of other organizations when it comes to attracting support. When your organization can find a way to help people solve their problem of finding fulfillment though charity work, they will be more willing to jump on board to help your cause. They support you because they can feel good about themselves while making the world a better place. The easy part for them is; they only have to write a check. The hard part for you is coming up with a creative way to show the need for donations in a way that is also compelling to the perceived needs of the donor. Rule 4: Build Trusting Donor Relationships: A recent national poll showed that a whopping 53% of Americans say they sense a “feeling of deception” about marketing. This distrust of marketing is also transferred to the outreach marketing conducted by nonprofits. Some organizations do exaggerate their results and overstate needs when trying to recruit support. Guerrillas are honest in all their marketing because they know that even if your marketing is 99% honest and 1% dishonest, that 1% will stand out in the minds of their target audience. All the marketing spin in the world will not make up for the smallest exaggeration of the truth in the minds of your donors. Rule 5: Respect Your Donors: Guerrillas know that there’s a world of difference between donor care and donor attention. Many companies lavish attention upon their donors, but only Guerrillas excel at caring and knowing how to make them feel sincerely cared for. Rule 6: Focus on Current Supporters: Why do you think that it costs five times as much to raise a donation from a new donor than from an existing one? The answer is easy…because the price is high to find a new donor while the price is free to find an existing one. Isn’t it true that it is easier and less expensive to renew a magazine subscription than to attract a new subscriber? That is why it is so important to keep in touch with your current donors. This has the effect over time of constantly increasing donations while reducing your marketing investment. You already have a list of your donors. Go back to it often to update information on them, keep communicating with them so when it’s time to give, it will be easy for you to ask. Donations may start off low, but over time those repeat donors will give more as you develop that relationship. It does not come easy, but you are practicing great guerrilla marketing to help that average donor become a major contributor. Rule 7: Make Giving Fun: You have a serious mission. The problems are real and you care about them. You want people to grasp the depth of the problems and take ownership of making the solutions happen. Your Guerrilla marketing is outlined by a serious and specific marketing strategy, but that doesn’t mean you can’t have a little fun while raising money. It is no secret that your organization has to do something different to get the attention of donors. Nothing gets people’s attention better than a little fun! Great post hopefully nonprofits take advantage if this to increase their fundraising efforts.